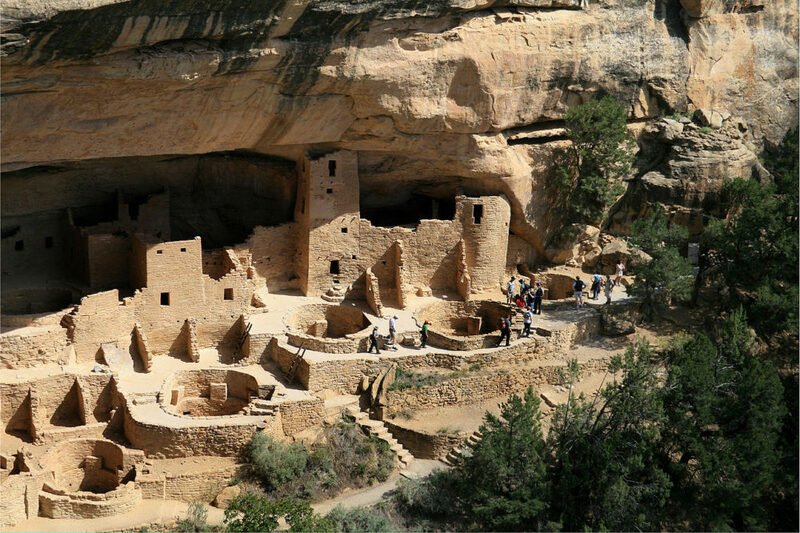 Andreas F. Borchert, “Mesa Verde National Park Cliff Palace” via Wikimedia. Native peoples in the Southwest began constructing these highly defensible cliff dwellings in 1190 CE and continued expanding and refurbishing them until 1260 CE before abandoning them around 1300 CE. Changing climatic conditions resulted in an increased competition for resources that led some groups to ally with their neighbors for both protection and subsistence. The circular rooms in the foreground were called kivas and had ceremonial and religious importance for the inhabitants. Cliff Palace had 23 kivas and 150 rooms housing a population of approximately 100 people; the number of rooms and large population has led scholars to believe that this complex may have been the center of a larger polity that included surrounding communities.